Perhaps think of the profile like you would a dinner table at big family gathering. When people show up, they expect the table to be filled with food, and they expect to sit around it for hours talking. If there is no food, expectations haven’t been met, and, more than likely, no one is going to spend significant time around that table. The same thing goes for the profile. If there is no engaging information, the visitor will quickly leave. Regrettably, many people only do the minimum to their profile and “hope” that generates them new opportunites. Of course, it is clear why it won’t. If your profile is not filled out to its fullest form and instantly recognizable as your brand, your effectiveness will suffer. 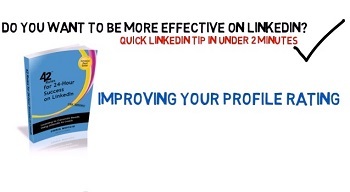 In terms of creating an effective profile, this is the first step. We'll be releasing additional short video clips that continue to share more insight. Bookmark our site and check back soon.